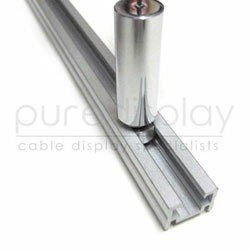 This rail track makes installation of cable display systems even easier. Instead of drilling individual holes for each cable display kit, simply fit a track to the ceiling/wall and another to the floor/wall. Tracks come in 1 meter lengths (39.37"). Track Toggles and Cable Display Kit not included.